We recently took a trip to Portland, Oregon where I visited several of our favorite bakeries and coffee shops. Perhaps my favorite is Crema – home of the biggest, fluffiest, most perfectly sweet zucchini muffin I’ve ever had. Since I’ve already mastered the art of the Gluten-Free Zucchini Cake (<- OMG have you tried it yet? ), I wanted to venture into the land of carrot cake. This recipe would certainly work as a cake, but I wanted to go the healthier route that didn’t require frosting. Muffin tin, loaf pan, cake pan: Whatever route you choose this 1-bowl, vegan, gluten-free recipe is going to blow you away! I literally couldn’t stop eating these (always a good sign). 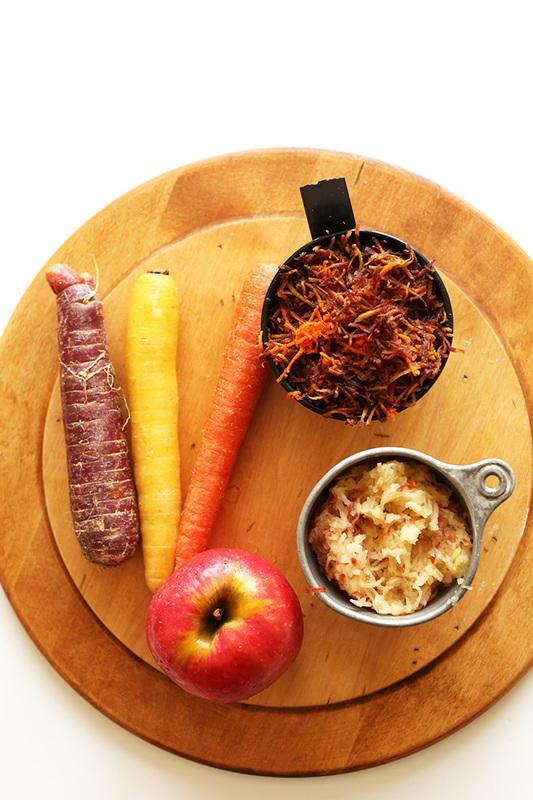 The recipe starts with some of nature’s best sweeteners: Banana, apple and carrot. You can either use applesauce or grated sweet apple (a tip I got from a friend). I’ve tried both and they work well. Plus, it replaces some of the oil to provide plenty of moisture. 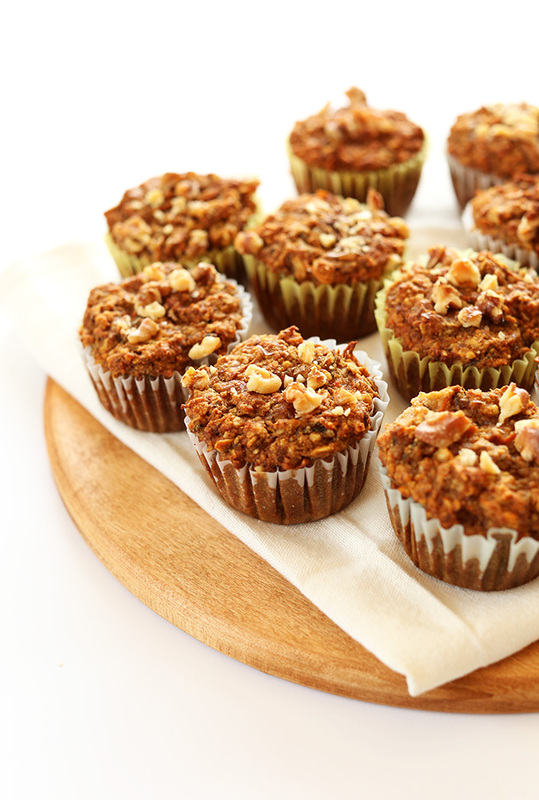 Top these muffins with crushed walnuts for an extra kick of healthy fats, protein and Omega 3 fatty acids. In an ideal world I would eat a handful of walnuts every day; sometimes on top of a muffin, sometimes in granola, sometimes straight from the jar. It doesn’t always happen but it’s a personal goal of mine. Can’t get enough of these nutrient-packed nuts. Not only do these muffins require just one bowl, they’re also vegan and gluten free and surprisingly healthy! The only exception to the “healthy” label is the brown sugar (which I don’t mind in reasonable amounts). But if you’re looking to keep this recipe more natural, I’ve included muscovado (an unrefined brown sugar) as a substitution suggestion. 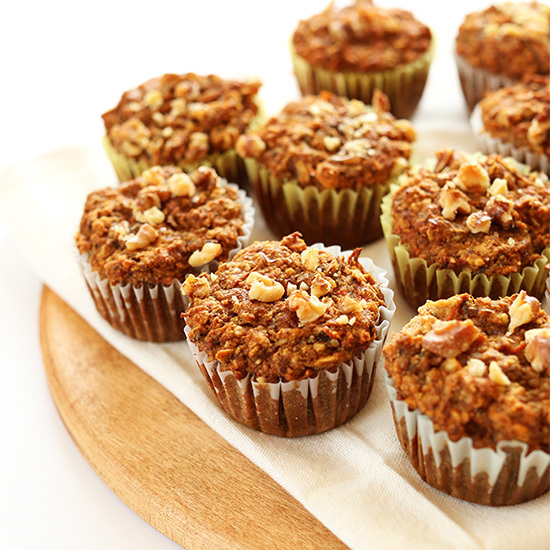 Keep these muffins on hand for a quick, on-the-go breakfast or snack. I love packing these when we’re going on trips instead of having to buy super sugary and processed alternatives. If you make this recipe be sure to take a picture and tag it #minimalistbaker on Instagram! I love seeing what you guys cook up. Cheers! Vegan, gluten-free carrot muffins loaded with fruit and veggies. Super moist and flavorful, healthy, and made in one bowl! Perfect for on-the-go breakfast and snacking. Prepare flax eggs in a large mixing bowl and preheat oven to 375 degrees F (190 C). Prepare muffin tin with liners or lightly grease them. To flax eggs, add mashed banana, agave or maple syrup, olive oil and whisk to combine. Next add applesauce, brown sugar, baking soda, salt, cinnamon, and whisk to combine. Add oats, almond meal, and gluten-free flour blend and stir. 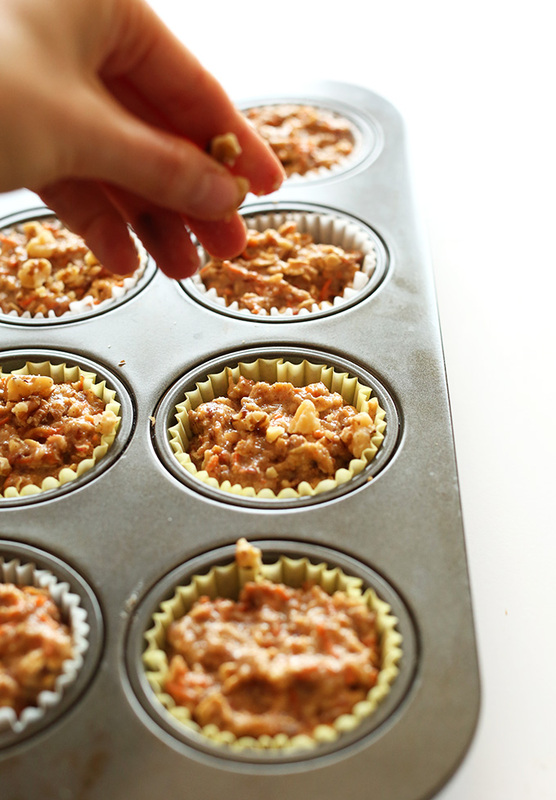 Divide evenly among 12 muffin tins, filling them all the way up to the top, and top with crushed walnuts (optional). Bake for 32-36 minutes, or until deep golden brown and a toothpick inserted into the center comes out clean. When you press on the top it shouldn’t feel too spongey, so don’t be afraid of over baking! The GF blend just takes longer to bake. Remove from oven and let set in the pan for 15 minutes. Then flip on their sides still in the pan to let cool completely. If you try to unwrap them too quickly, they have a tendency to stick to the wrappers. Once cooled, store in a covered container or bag at room temp to keep fresh. Freeze after that to keep fresh. *Use 1 ½ Tbsp (10 g) flaxseed meal + 4 Tbsp (60 ml) water to make 1 1/2 flax eggs. *You can sub 1 sweet apple in place of 1/2 cup applesauce. *If baking in a loaf pan or cake pan (8×8), bake for 45 minutes – 1 hour and check every 5 minutes thereafter for doneness. I subbed oat flour for both the almond meal and gluten free blend as well as extra applesauce instead of the banana and they turned out AMAZING. Best GF muffins I’ve ever had! Thank you for your recipes, they are always winners! Whoop! So glad to hear it, Julia! Thanks for sharing your modifications! I don’t eat banana so can I sub it for more apple sauce? Hi Chelsey, we would recommend adding a touch more sweetener and subbing in extra applesauce for the mentioned amount of banana! Hope that helps! Soooo delicious. I used real eggs instead of flax because I didn’t have any flax. I doubled the recipe to have some to freeze later. I doubled the recipe (I cook by weight) and it made 24 muffins and a whole loaf. But I’m not going to complain, because I’m sure we’ll put them to good use. ;) Thanks for another winning recipe! Wow! I made these for breakfast for my daughter’s vegan friend, and we all (non-vegans) ate them up. I used a chia seed egg (following your recipe, Dana–thanks!) and all-purpose flour for the almond meal and gluten-free flour, because that’s what I had on hand, and it took about 20 minutes to bake to perfection. I’ll definitely make these again! Thank you! I’m not gluten-free. Can I use AP flour in place of the gluten-free flour mix? Yes, that should work! Let us know how it goes! Hope that helps! My question is it possible to do without the oats? Hi Dana, though we haven’t tried it, we think you might be able to replace the oats with additional almond flour. If you give it a try, let us know how it goes! Really good! Made a crumble topping and my sister ate them up! Grilled on a pan with some butter or simply spread some PB on them… so good! We had bananas and apples that needed to be used so I searched last night and found this recipe (and the one for the pb&j muffins). Couldn’t decide which to make so did both! Amazing! Delicious! My husband ate 2 of each. Used unsweetened cashew milk (I was out of almond milk) and regular all purpose flour (no gluten issues) and they were perfect. Will definitely be making both recipes again. I love the idea of these muffins! Unfortunately, instead of the GF flour blend, I used what I had on-hand, which was organic all-purpose GF flour. I baked it at 375 for 35 minutes, and lo and behold, the walnuts (and added chocolate chips) and muffin top all burned! Any thoughts? Maybe it’s just my oven… or maybe it was because of the flour? I tried another batch for only 30 minutes and they look at lot tastier. They don’t look like the gorgeous muffins in the photo, though! Any thoughts are welcome… Thank you for this recipe!! I made these with all purpose flour & 2 eggs (& still want to try the Vegan, Gluten-free variety too), & they turned out FABULOUSLY! My 1st time ever baking homemade muffins, but am now hooked on baking! Question: what are the calories for the muffins for the non-Vegan & GF variety (all purpose flour & 2 reg. eggs)? Thank you & I love your recipes!! Hi Jamie! We’re glad you enjoyed these muffins! I am not sure what the nutritional facts are on a non-vegan version but you’re welcome to calculate that yourself using this tool! Made mini muffins. Cooked them for 16 minutes and they were perfect! Used one egg and whole milk. They were perfect. I made them previously with coconut oil, egg and almond milk and I think I liked the taste better…but both got good reviews from the family. Thank you! Wow!! I had a lot of fruit to use before it went of and this recipe was awesome for it!! I swapped the flax eggs for 2 hen eggs (might try 1 next time) and swapped the gf flour to just plain flour as I didn’t have those ingredients and wasn’t bothered to go to the shops lol. But this was delicious!! Usually when I make super healthy stuff like this it tastes plain and gross so this was an amazing find!! Going to print the recipe to add to my collection of good finds on the net! Made this as a loaf and used whole wheat flour instead of gluten-free and only half the sweeteners as I think the fruits added enough sweetness. They tasted absolutely delicious, although the cooking time was way longer, like over an hour – maybe because of the flour? Yes, that may have been the reason! could I opt out the brown sugar ? Exceptionally moist and addictive! I’ve made it twice and somehow it came out even better the second time. Have given mini-loaves (instead of muffins) and the printed recipe to friends, who also really loved it. Has anyone tried putting less sugar/honey? I’d appreciate any suggestion. I didn’t have almond meal so I increased the the GF flour to 1 1/4 c and used 1/4 c oat flour. I also used Bob’s red mill all-purpose GF flour blend and added xanthan gum. The texture is a little spongy and chewy, but they still taste delicious! I also used vanilla unsweetened almond milk which works well. I’d like to find a healthier replacement for the sugar in the future, perhaps more banana instead of brown sugar? I wasn’t sure if it was supposed to be packed, but I left it loosely measured because I try to minimize sugar intake. And it worked out great! I find that I have to bake mine much much longer than what is listed in the recipe. What do you suggest to not have to cook them for what seems like forever? I seem to have this issue with every vegan recipe I make. The inside is always wet. Hi there what if I substitute the banana with an advocado? Yes, that could work though we haven’t tried it ourselves. Report back if you give it a try! I cannot wait to make this recipe! Unfortunately, I cannot eat any kind of flour- other than almond flour. I will try these with almond flour only, I’ve never cooked with almond flour before. Do you think that would be ok? Hi Sandra, Unfortunately, I wouldn’t recommend using just almond flour for this recipe, but if you experiment with the recipe, report back on how it goes. Good luck! Hey there! What are your thoughts on combining tapioca flour + ground oats in replace of the GF flour blend?! Hmm we haven’t tried that combo and can’t say for sure, but if you experiment with it, report back on how it goes. Good luck! We are not gluten free, so I use regular flour, but I don’t make any other changes. Love the recipe— very simple and straightforward to follow. Turned out delicious and soft. I substituted all purpose flour instead of the gluten free mix. I baked them for 20-25 minutes. Checked on it every 10 minutes to see how they were browning. I’ve made a few different recipes from your website. All turn out very well. Thanks. Hi Dana — do these freeze well? If so, for how long? Thank you! Yes, these will freeze for up to a couple of weeks. I had a similar problem with the time. Mine started to burn at 27 minutes. The whole every-oven-is-different is v. true and I strongly suggest folks start checking them at 25 minutes. They would have been toast at 32 mins. Made another batch with much shorter time and they’re great. I substituted the almond meal and gluten flour with all-purpose flour, and the banana with some pumpkin puree. I also threw in some more cinnamon and about a tablespoon of pumpkin pie spice. Very fluffy and moist! Delicious with vegan butter and a small sprinkle of salt. I think they need a bit more spice though! They came out perfect. Thanks for the recipe! Thanks for sharing your changes, Eva! Did everything the recipe called for… muffins did not cook on the inside, but started to get crusty on the outside ;( not mad, just confused and want to solve this problem. Not sure if it is where I was placing the muffins in the oven of if I was using a muffin thin that is smaller then the” normal” size? I thought there was only one size. Made these this evening and am a bit confused as to why they didn’t work. Baked them for 25 minutes more than the suggested time at 180 as the tops were starting to burn and allowed to cool in the tin etc but still completely sticky inside. The mixture is delicious but it just did not want to bake! Followed the recipe exactly, apart from omitting the brown sugar and I also added orange zest and a few sultanas. I used fresh finely grated apple instead of apple sauce. Any ideas why it went wrong?! These look amazing! I am allergic to apple- any ideas for a sub? Maybe more banana or more oil? Thanks! I’d recommend just making this recipe in that case, Dee! Thanks for the recipe, I will try that too, though I was really hoping to make carrot muffins for fall. Do you think I could sub extra carrots & banana for the apple? For the apple replacement: how about a mix of extra grated carrot and grated zucchini? Maybe the zucchini will mimic the wetness of the apple. I have made these a few time now, they are delicious! Everyone in my family loves them, including my 3 year old who often asks for them for breakfast. I make double batches and freeze them. Thanks so much for this great recipe, it will continue to be my go to. Another winner for our half vegan-half gluten free family! Since it’s beginning to get colder outside i’m finding myself waking up and craving warmer and more comforting foods. Carrot muffins are on the top of that list and so I was delighted to find a healthier version of them! The only item I didn’t have this morning was almond flour and so I had to improvise a little bit. I followed your suggestion of adding more dry ingredients and it worked! The muffins smelled amazing while cooking and they tasted even better! The only suggestion I have to fellow bakers is to watch the rim of the muffin tops. Since it took longer for the muffins to bake I by accident burned parts of the edges :( So, next time i’ll just add foil to the outside so they don’t burn. Thank you for sharing, Eliana! We are glad to hear that you enjoyed them! Apologies if this has already been asked but as I’m not GF and dont have the ingredients for the GF flour blend on hand, what can I use instead? Normal plain flour? You can use whole wheat or all purpose! See comments above for tips! Can I omit the brown sugar and use raisins instead? I made these yesterday and they are delicious – flavoursome, moist, really yummy! Quite soon after making them though they turned a suspicious green colour! Still taste great but I’m wondering what happened? I followed the recipe except subbed in coconut oil instead of olive, lactose free milk instead of almond, sunflower meal instead of almond meal & a mix of spelt/GF SR flour instead of GF Flour blend. Could any of those ingredients/combinations resulting in green? Also just checking is it baking soda or baking powder that I should be using? Thanks! These are so delicious! I always double MB recipes now because there is never enough when they taste this good! I topped them with a thawed vegan cream cheese I found leftover in the freezer and sprinkled with walnuts. Seriously.. I’ve had way too many and the kids are loving them too, have to freeze so I keep them for lunches. (they freeze really well and if you want them soon just pop them in the microwave on defrost for 2 minutes or so or just put them on the counter for a half hour or so before eating) I used the almond meal that I make from the leftover pulp from almond milk- so not the nice white meal that you can buy at the shops and it worked great! I used all purpose spelt flour, and used half wholemeal and half white. Another winner! Thank you so much! Hi can I use blanched almond flour in place of gluten-free flour? I wouldn’t recommend using just almond flour, but scan through the comments above for tips on replacing the GF flour. Good luck! Thank you for the wonderful recipe! I cannot wait to make it for my kiddos! I was wondering if I could use dates in place of bananas. I have dates , but no bananas . Thank you! Hi Miranda! While we haven’t tried that substitution and can’t say for sure, we’d love to hear if you experiment with it! Typically we like to use applesauce or pumpkin puree in place of bananas but let us know how it goes. Good luck! *I changed a few other things in the recipe as well, so it is no longer vegan, but just substitute with the original ingredients if you prefer. Pre-heat oven to 375°. Prepare muffin 12 sheets in tins, and lightly grease with coconut oil or butter. Mash ⅔ very ripe, or thawed frozen banana. Whisk 2 eggs, and add banana, ¼ cup maple or date syrup, and ¼ cup coconut or olive oil. Then grate, shred, or finely chop 1 medium apple. Add to mixture along with ½ cup muscovado, brown, or unrefined sugar, 1 tsp cinnamon, 1 ½ tsp baking soda, and ½ tsp salt and stir. Add ½ cup unsweetened almond milk and stir. Grate 2/3 heaping cup of carrots, and 1/3 heaping cup of zucchini, then stir into mix. Mix in ⅔ cup oats, ½ cup almond meal, and 1 cup + 2 tbsp coconut or whole wheat flour and stir. Divide evenly between muffin tins, filling all the way to the top. On top add crushed walnuts, or almonds (optional). Bake for 30 min, then check, and add 5 min if needed. When done, a toothpick should come out clean from the middle of the muffins. Let set in pan for 15 min. Then remove from pan and let completely cool. Store in a covered container at room temp after cooled, and then freeze afterward to keep fresh. Thanks for sharing your recipe changes, Charlotte! I tweaked a few things. I used coconut sugar instead of brown sugar, bran for almond meal, and just straight almond flour. However it was the most delicious vegan muffin I have ever tasted. Next batch I want to see how it cooks without the oil. Hey! Just wanted to share what I did… didn’t quuite work out how I imagined it would but hey.. you live and you learn. I used normal wheaty flour, hens eggs and instead of using almond meal I used LSA cause thats all I had.. I’m a student so often can’t afford all the ingredients used in these recipes..
Aanyway, I ended up having to bake them for about an hour and a half (turned the oven down after about 40-50 mins to stop the outside burning).. Eventually took them out because I got bored of checking the oven every 5-10 mins.. They’re definitely tasty its just the outside is super tough and the inside is still kind of sticky.. Yum.. different.. my flatmate said she loves them like this.. but yeah..
Much love to you Dana, love your work. I’ve got to say I love this recipe! As someone who is intolerant to egg, lactose and gluten! Ha, these have been great I’ve made them a couple times and they have turned out great everytime. Not at all like some gluten free stuff can be like. And! My family loves them too, I usually double up the recipe and do 12 jumbo muffins, I’ve also done the zucchini bread and muffin form to! So good. Yes! Other readers have had success with this. Scan the comments above for tips! These muffins sound delicious. I’m vegan, GF and do not eat sugar, brown sugar, etc. Can I substitute honey or maple syrup? Hi Susan! While we haven’t tried that sub, you can generally sub up to half of the sugar in any recipe with maple syrup or agave nectar. If you give it a try, report back on how it goes! I’ve made this couple times now and it always turns out great! I take these to work or serves to guests and they all love it. Even my 7 year old son eats it too and he’s a picky-eater. Thank you , Dana, for sharing this healthylicious recipe! ? 5 muffins were gone as soon as these came out of the oven. We’re gf df and the moist deliciousness of these really hit the spot for a bread-y treat. I added raisins, walnut halves, and a bit of crushed pineapple to the last 3rd of the muffins balancing the extra moisture with a little more gf flour. Still a touch damp in the middle, but otherwise Perfect! I love all the protein from the almonds and walnuts. Fantastic! Thank you. Great additions to the recipe, Stephanie! Thanks for sharing! I made these and they taste great but SUPER dense, not light and fluffy as described. I’m wondering if I did something wrong? What is it in the recipe that makes it light and fluffy? Hi Jess! It may just be the nature of these muffins – they are a little bit more dense than some. If using spelt flour do I still use rolled oats and almond meal? Or do I sub spelt flour for it all? If you are using spelt flour, keep the rolled oats and almond meal as well! Saw this recipe on instagram on my way to church this morning. Luckily I had all of the ingredients back at home. I whipped these guys up in 45 minutes right before supper! They wowed the whole family. One picky little cousin went for seconds! Why knew you could make vegetables taste so good! Thank you for sharing 10/10 would make again!!!!! Glad you enjoyed it, Gabby! Can you use less sugar or would it change the consistency? You can cut down the sugar! Check the comments above for tips. Mine didn’t come out great unfortunately! They didn’t rise and were very dense and undercooked :( The mixture seemed quite dry, would adding more almond milk solve this? Yes, I would add more almond milk next time and that should help. Hi Jeanne! I would recommend adding a touch more sweetener and subbing in extra applesauce for the mentioned amount of banana! I’d consider removing the vegan comment about honey. I’m a vegan, and honey is vegan. The subjective reasoning behind honey not being vegan is extreme and applies only to certain ways honey is obtained, having nothing to do with honey being vegan. In CA, we have a bee shortage due to them being killed off by insecticides. Raising bees does two things; increases the number of bees and the amount of honey, which is way too much for bees to use. Hi! What can I replace almond meal with? This recipe is perfect for him except for the almond meal because he’s allergic to them. Thanks! Hi Othelea! Another nut meal would work well (maybe walnut?). Otherwise, just up the amounts of the other dry ingredients to compensate. Hope that helps! That should work well, hope he loves them! Might there be a substitute for the oats? Been suggested I stay away from oats, even gluten free right now and would love to make this recipe! Ideas? Hi Leslie! You can try and sub more almond meal, quinoa flour, or more GF Flour blend! I tried these and they came out great! Just wondering how soon after cooling must they be frozen? And best way to defrost after freezing? Thanks! Let them cool until they are completely cooled and then freeze! To defrost after heating, you can either leave them on the countertop to defrost, or pop them in the oven/microwave for a couple seconds. I made these yesterday! I love them. I added raisins, and sprinkled sliced almonds on top as well in addition to the walnuts. I am a huge carrot cake fan, and I liked these… but my only feedback is I wish they had a stronger carrot flavor. I think next time I will add more carrots maybe 1 and 1/2 cups of shredded carrots packed down instead of the one cup. These are great though! I will make these again! I don’t have any brown sugar. Can I leave out the brown sugar altogether, or should I add more maple syrup? Hi Jen! Other readers have left out the brown sugar entirely, but you could always add a bit more maple syrup if need be. Ah-mazing!!! Thank you for your recipes, this is probably the 5th I’ve made and they have been delish. I love this recipe bc it allows me to use the pulp leftover from carrot juice I made in another one of your recipes.. I see what you did there ;) haha but really, tasty, moist and makes me feel great! Pinned and sent off to others to enjoy! Thank you for a great recipe. Kids loved it and so do my husband and me. I put 2 eggs and put more apple sauce instead of sugar and it is very yummy! These are delicious, I’ve made them multiple times. I make carrot juice a lot and was looking for a way to use the pulp and this is it!! Thank you for this recipe and all the other delicious recipes that you share with us! Loved the muffins, but I did alter a few things, only because I didn’t have certain items, and I’m playing around with a few new ingredients. I’m only posting the alterations in case anyone else wants to try them- the original recipe looks perfect! So I used some crushed fresh (frozen) pineapple instead of the apple because I was craving it with carrot muffins! And then I used close to a 1/2 cup of white spelt flour and the rest chickpea flour (that I milled in my thermomix), in place of the oats I used quinoa flakes.I couldn’t add wants sadly as they are for school lunches and it’s all nut free these days, but to some muffins I put sultanas and that was a nice addition as well! The muffins took about 30 minutes and were so moist and delicious. I find MB’s recipes always so easy and delicious- even when I have to alter some things! Never ever disappointed. Not ever. Thanks for being such a big part our family meals! Thanks so much for sharing the changes you made, Carmella! This is a huge help to others when they are looking to sub out ingredients. Glad you enjoyed the muffins! Delicious breakfast muffin! I found this when looking for a recipe to use up some delicious organic carrots in my fridge. Made these with my 5 y.o.’s help. Even with modifications, recipe produced a beautiful texture and rise. Needed vegan, but not GF, so I substituted some whole wheat and regular AP flour as another reviewer suggested. I also reduced the sugar and honey a touch, left out the nuts/topping, pulsed the carrots and apple in my food processor instead of grating (bum shoulder), and added a splash more milk during mixing because I soaked the oats in the 1/2 cup of milk. Thanks for a wonderful recipe, Dana! I’m unable to have almonds. Is there a gf option that you could suggest? The first time I made these, I misread 1 1/2 flax eggs to be 1 1/2 cups of flax eggs. So I made them with a mixture of 1 1/2 cups of flax and hen eggs and they actually turned out really good and I liked how much protein and omega fats they had in them! what can i use in place of almond meal? Hi Isis! Just sub it with some other dry ingredient if you’d rather. Hope that helps! Actually scratch that, they’re raw inside still? I made these & cooked them at 190c for 32 minutes exactly and the tops are now covered in burnt walnuts! Hopefully I can pick them off because the rest of the muffin turned out great! I added and extra tsp of cinnamon, some ginger, and 2 tsp of tumeric to add spice and make them more anti inflammatory. Subbed coconut sugar for the brown sugar! Used 2 free range eggs from my chickens. Thanks for the GF, veggie and fruit packed recipe! I wanted to make these muffins for breakfast this morning and my husband and I, new vegans, are still figuring out how to stock our pantry so I didn’t have a few of these items. I had to substitute half a cooked sweet potato for the banana, blended some firm tofu with water for the almond milk, used a combo of reg and whole wheat pastry flour, subbed corn for almond meal. Oh and I didn’t have walnuts (for shame!) :-). The texture is great but next time if I’m lacking bananas and making this, I will add vanilla or some additional spices to boost the flavor profile a bit. These were so yummy! Definitely making it again! This is a fantastic recipe. Im not vegan but really enjoy the imaginative and yummy ideas vegans often present, combining ingredients I might not have considered. I confess to adding 2 eggs, upping the oats to 1 cup, and exchanging the almond meal for gf flour; I used garbanzo bean flour to up the nutrient density. They are wonderful. Thank you. What else available in grocery store I can find it…? OMG these are one of the best muffins I have made in a long time. Super moist, tasty, easy and I love the flax seed egg, I have never tried that before and I’m amazed by the finished product. Thanks, I am a follower now!!!!!!!!!!!!!! I made these tonight with carrot cake in mind so I added a dash of cloves and nutmeg, and then raisins. I did not have applesauce so I finely shredded the apple in and I used maple syrup. They are so delicious and decadent. I took powdered sugar and water stirred them up to look like a white glaze that I drizzled on top. Absolutely delicious! What is almond meal? Is there another term for it? Not familiar with this product. Is it this sam as ground almond flour? Recipe sounds super yummy, can’t wait to try it! Oh, and what exactly do you mean by “sweet apple”? Hi Kristy! Like almond flour, almond meal is made from ground almonds, though typically has a more coarse texture and contains the skins. It’s commonly used for baked goods like cookies and quick breads, and because of the coarse texture it can be used as a substitute for breadcrumbs for coating meat and topping vegetables and casseroles. Secondly, by sweet apple we recommend either Gala, Rome Beauty, Stayman, or Golden Delicious which all tend to be sweeter options! Thanks for the super quick reply! Plan on making these while kids are at school today so they have them for snack when they get home. PS, I have made your zucchini chocolate loaf recipe and we all loved it! Hi Kristy! You just need 1/2 cup of grated apple! Is almond meal the same as almond flour? Idk what almond meal is. Can I use gluten free oat flour in place of the gluten free flour blend? Has anyone tried date nectar in place of the brown sugar? How long does it last when I freeze them? Hi Rico! They should last for a couple weeks! I halved the sugar and they were still amazing! I also used coconut oil. I am so thrilled! Made this this morning and my toddler and I loved them. Just enough sweet and moist ! This looks like a great recipe. Can I use regular wheat flour instead of almond meal? Hi Kathleen! Yes you can! Thank you so much for responding. I’m going to make these tomorrow. Can’t wait. I made these and they are absolutely delicious! They are moist and flavorful. I am not vegan, but was looking for something gluten free, because my husband and I try to limit our servings of wheat per day. Changes I made: I used 2 large eggs in place of the flax eggs. I used a large whole apple and chopped it up in the food processor. I only used 1/4 cup brown sugar (along with the 1/4 agave). I used regular whole milk. I used 1 1/2 cup of grated carrots (again, chopped them up in the food processor). Finally, I used flax meal instead of almond meal. I’m making these for my son’s class this week! He was assigned apples as his ingredient to share. Thank you! LOVE ALL YOIR RECIPES! Hi Sylvana! We haven’t tried it, but it should work! Report back on how it goes! Made these but with one egg instead of the flax egg. They were very delicious, tasty and moist. Love them – one of my favorite muffins. Just baked these muffins, and the smell is just amazing! Can’t wait to eat them! Amazing! 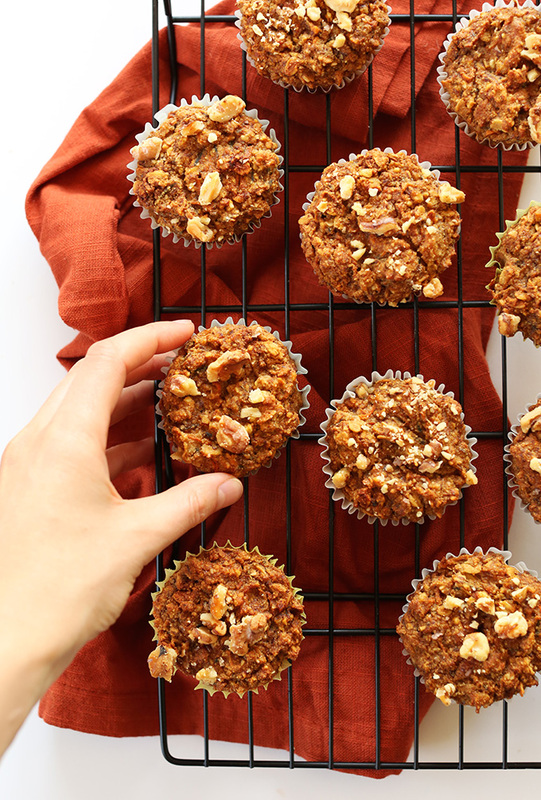 There is some almond meal in the pantry I’ve been trying to use up and these muffins look like just the ticket – super yummy and healthy. After reading the comments I’m going to try and whip up a batch with whole wheat flour and non-flax eggs. We’re not vegan or GF in our house (although we like lots of food that is) so we don’t have all of the ingredients on hand. Thank you to all of the other commenters for sharing your tips and to Dana for sharing this recipe! I make these and they might just be my favorite muffins ever! I added unsweetened coconut and raisins and they turned out great. I have an almond allergy..what could I sub for the almond meal? Hi! Check out our recipe FAQ! I would like to make these muffins but dont require them to be GF. Can I substitute the GF flour blend for regular flour at a 1:1 ratio? Hi! If I want to make this recipe almond free, can I use soy milk and the same amount of flour as almond meal? I feel like flax eggs never work for me, can I use any other egg subsitute? If I don’t need this to be glutenfree, can I simply leave out the almond meal and glutenfree flour and use all-purpose flour instead? Okay, sorry, I just found the answers to both questions in the comments…! These muffins are absolutely amazing! I have been making them almost weekly. They are sooooo delicious and much healthier than the ones I was buying at the grocery store! Thank you for sharing! Hey there! I am looking forward to making these muffins for my children (1 is 2 years of age). Q1: Would I be able to eliminate the brown sugar since there’s other sweeteners in the recipe (ripened banana, apple sauce, maple syrup)? Q2: Would I be able to use whole wheat flour? Instead of the GF flour blend? (we are not a GF household). Hi Jenny! You can eliminate the brown sugar and add a bit more banana. Also you can use whole wheat flour as a substitute! My little one can’t eat eggs and I was looking for a yummy recipe for muffins that might also make yummy and healthy “cupcakes” for his birthday. He loves these as a snack and they were super yummy with some cream cheese frosting! I had carrot pulp from juicing and this recipe popped up on my search to use it AND my 6 year old daughter wanted carrot cake…so we agreed that this was a “must try.” Her review is “thumbs up, awesome!” I did have to sub some items since my almond milk won’t be ready until tomorrow and I’m out of flax seed. I used two organic “whatever the farm sent-sized” (large?) eggs in lieu of flax egg. I used fairlife whole milk vs almond, coconut oil vs ovoo, carrot pulp with 2 tbsp of the carrot juice added back vs grated carrot, one whole pink lady apple blended in the ninja, I blended almonds into almond meal in my ninja and I used half whole wheat and half unbleached flour. I adjusted the dry ingredients down a bit, because of the carrot pulp I used versus the grated carrot. It filled the 12 tins perfectly. I only had to bake in the 375F oven for 26 minutes. Thank you!!! This recipe allows you to do so much with it! I made these with regular flour, shredded coconut instead of almond meal, and added vegan chocolate chips for my kids who scoffed at carrots in a muffin. They turned out great! You are my absolute FAVORITE recipe author/goddess. Thanks for another hit! I made this recipe this past weekend and it turned out wonderfully! The muffins were so moist and delicious. I will be making these again soon! Thanks for always posting such great recipes. My son is allergic to bananas (and avocados so I can’t sub that either)…could I use more flax egg instead? Thank you!! Hi! Perhaps 1/4 cup of apple sauce or pumpkin puree in place of the banana? How long will they stay fresh? I would like to bake them on Friday and serve the on Sunday morning? I made them on Monday and just kept in the fridge and they still tasted awesome this morning (Wednesday)! That should work! I’d refrigerate for sure though to keep them as fresh as possible. Second time making these! They are so good, super moist and I subbed in shredded apple for applesauce, and added some cloves and nutmeg. Would highly recommend! The unit is missing from the flax eggs. Is this Tablespoons? My husband DOES NOT like bananas…. What would you suggest as a sub. ? Check the comments for subs! Hi from Indonesia! I’ve been following your blog and this muffins made my day. I am not a big fan of baking, but this one is exceptional. Thank you so much for sharing! Hello!! could i use almond flour instead of almond meal? Hi Brianna! That should work fine, but the texture of your muffins may change! Great muffins! I made a couple of substitutions – used a whole banana instead of measuring out 1/3 cup; used 1/2 cup medjool dates in place of the brown sugar; chia instead of flax (and I didn’t let them gel in water – just threw them in since I was already adding extra liquid with the dates and banana). I combined all the wet ingredients in my vitamix because I hate mashing bananas and grating carrots. Also, I’m not gf but love recipes with almond flour. I used 1/2 cup ap flour, 1/2 cup whole wheat, and 1/2 cup almond flour. I ended up with delicious muffins that I feel ok giving my toddler for breakfast. Hey all, I am not gluten free or vegan so I made this without those considerations. I used 2% cow’s milk, and hen’s eggs for the dairy. Instead of GF flour blend I used the requisite amount of almond meal and then did a 50-50 mixture of pastry flour and all-purpose whole wheat. Also should note that I did half coconut oil and half olive oil for this one as I ran out of EVOO. I also added about an 1/8 cup of grated fresh ginger for funsies. Results were FANTASTIC!! I only needed to bake them for 30 mins flat and they were PERFECT. They are fluffy on the inside and crusty on the outside, and rose up perfectly! These came out great ! These are delicious! Quite easy too, though if you don’t have GF flours then you’d best be prepared to spend a fortune on getting some (lucky for those of us that need to do this, they’re great muffins and we will want to make them again). these are probably my favorite muffins, ever. I like to always have a fresh batch of muffins made on the weekend to get me through the week. I have these in the oven now as my second batch! This time, I made them with whole wheat flour, and more applesauce instead of banana because all of mine were green. Oh and a regular egg instead of flax. Plus some golden raisins. I hope my substitutions are not sacrilege! These are amazing! These muffins came out delicious! I didn’t have a banana so I used a pear instead and a large apple instead of the applesauce. Wow! They were good. Thank you for this recipe. I’ll definitely make again. Do you have any suggestion for substituting almond flour with non-nut flour? If you do, please let me know. Thank you. Hi Em! Check the other comments as people had success with this! Hi Dana! I have made these muffins so many times! They are so so delicious! I’m thinking if using this recipe to make a 6inch smash cake for my sons first birthday. I will use any left over to make a few muffins. Would you have any recommendations for adapting the recipe to a 6 inch cake? Thank you so much!!! Hi Jessica! Bake for 35-45 minutes and check every 5 minutes after that! What a great recipe, the whole house loved it! I added more spices, raisins, used a bit less sugar, and am calling them carrot cake muffins. I actually plan on making these for my birthday next week, adding some vegan “cream cheese” frosting and calling them carrot cake cupcakes. Love them! Hi! Can these be made with Energ-y egg substitute? Also, I wanted to use trader joes gf all purpose flour. I know you make our own, but do you know if those would work? Or can you recommend any gf flour that I can purchase. I’m new to this so I’d feel better going with a gf flour blend that’s premade. Thanks! Is there any substitute for mashed ripe banana? I haven’t eaten a banana in over 30 years (seriously)! This has hindered me from making MANY recipes over the years. I’d be glad to learn of a substitute so that I can tackle this (and potentially other) recipes calling for mashed ripe banana. Thanks in advance! Hi Melanie! Check the comments to see what other people had success with! Good luck! I just made these muffins and they came out amazingly, super moist as well. I added some chopped dates, walnuts, nutmeg and vanilla to the mixture for some extra flavour. Don’t know why I never thought of adding grated apple for some sweetness, great idea. Thanks for the recipe! I made these with chia eggs in stead of flax as i am out of flax and i left the sugar out, with the syrup and apples there is no need for it. They were so good, moist and perfectly sweet. Thanks for the great recipe. I would like to make these muffins, I was wondering if there is a type of flour that I could use such as coconut flour to substitute the flour blend. I am not gluten free, so purchasing the separate ingredients to make the blend for muffins seems a bit over kill for my tight budget but still would prefer to use a healthier option than an all purpose flour. What would you recommend for the best texture and how much? Hi Jenna! Check the comments above as others experimented with different flours. Both all-purpose and whole wheat work well and then some people used coconut flour. Good luck! These just came out of the oven about 30 minutes ago and I’ve already eaten two. I made some substitutions with what I had on hand. I used eggs instead of flax eggs, apple butter instead of mashed banana, flax meal instead of almond meal and opted for the grated apple instead of apple sauce. The results were amazing. Moist, not super sweet, fantastic texture! Thanks for sharing! Oh! And I used coconut sugar instead of maple syrup and brown sugar. Seriously in love with this recipe–I was jonesing for a dense carrot cake loaf studded with walnuts and this recipe totally fit the bill, I added a handful of golden raisins and some nutmeg to up the ante even more. I don’t know why I even bother cutting slices, I should just sit down with the pan and a fork and have at it. I bake muffins every weekend for local homeless people. I made this recipe last week but used spelt flour and added raisins. They came out fantastic and asked if I’d make them again…. currently making them a second time. Thanks so much for a wonderful healthy recipe! We are allergic to all fats or non-heme proteins, so I was especially intrigued by this recipe. My second daughter is allergic to bananas as well so I subbed in grated cauliflower instead. We used normal flour, whole wheat flour (in place of almond meal), oatmilk, and a splash of OJ. Fingers crossed. Cauliflower! Who KNEW! The consistency is perfect! I also forgot to add that I used Ener-G egg replacer because we are allergic to seeds. And Also, he muffins burnt on top and bottom? I’m thinking my oven was too hot. BUT THE INSIDES were so good. I’m going to make them in the morning with maple syrup instead of honey for my sixth month old! Yummy. These are just as wonderful as your other 1-bowl muffin recipes. Thanks for such an amazing collection of easy, go-to recipes. These are fabulous. Just made them today. We really loved the walnuts on top. Super moist and delicious. I appreciated the one bowl directions too, thank you! Tried this today. I am pleasantly surprised by how delicious they are. I will try to tweak the recipe to leave out the brown sugar – but I loved it. Do you think GF Oat flour would be a suitable replacement for the blend? Hi! I haven’t tried using just GF Oat flour but if you do, report back on how it goes! These. Were. Awesome!! I’m going to have to double the recipe from now on. Thanks! I made these muffins this afternoon. I have to limit egg consumption and avoid dairy so I’m always on the lookout for recipes that do not include those ingredients. Since I don’t have a problem with gluten, I did not use GF ingredients. I added some golden raisins ‘cuz I love them. This is a terrific recipe…the muffins were delicious!! Thanks so much. I do love your recipes. I was looking for a carrot muffins without eggs recipe. I am not vegan, I just ran out of eggs. It just happened that I had all the ingredients. Except, I used real milk, instead of almond milk. The muffins came out perfect- very moist and delicious. Thanks. Saved a link to your site for later use. Ok, straight up – this was the best muffin I’ve ever had. Gluten or no gluten. Dairy or no dairy. It tasted amazing, and I felt good about the ingredients list. Usually I have to modify a recipe to fit my dietary needs, but it never tastes quite like it should. This – if I didn’t know it, I would have no idea it is gluten-free and dairy-free! I did make one small change which was to use 1 large egg in place of flax eggs. Other than that, made as directed and they were done in exactly 30 minutes. Moist, delicious, healthy… you’ve got to try them! Thank you for sharing this recipe! Will be making these muffin a lot. This recipe was so deliciously! I am in love with your vegan recipes, all the ones I have tried are so good for instance the vegan pumpkin pie and cinnamon buns rolls! Keep up the great recipes. Thank you so much for this recipe, it’s like having a bit of old muffin goodness with a healthier twist! I just made these for myself and my toddler and we both LOVED them! I had great success swapping out the brown sugar with coconut sugar, I just let the coconut sugar rest for about five minutes. We’re not GF so I used whole wheat flour and adjusted baking time, but I did add some flax meal for nutrition. These are my new favorite go to, thank you! I don’t have the ingredients to make gluten free flour. Can I substitute the Gluten-free flour with all purpose flour or spelt flour? If so do I use the same measurements? Yes, that should work! Same measurements. hello lovely recipe. although it tasted brilliant, mine turned out to be very oily! why could that be? Hmm, not sure! Did you change anything? These look delicious, thanks for posting! I just baked these today , I used quick oat and whole wheat flour , I don’t eat GF and I didn’t have this kind of flour . They look really good , but the batter was very thick I was wondering if this is because of the none GF ingredients I used ..I also baked it in my convection oven for 23 minutes and I have 10 muffins . My oven is super hot I also baked at 350f . Cant wait to try them I am sick with the flu so I am not hungry but I will let you know. I made this today in a loaf pan. The flavour was spot on…. but I forgot to put the oats in mine *face palm* so they turned out a bit gooey…. This was totally my fault for not reading the recipe to make sure I didn’t miss something. My plan B is to slice the cake up, and put the slices in the waffle iron for a bit. I will salvage this cake, or eat it and pretend it is pudding cake. This is way too delicious to waste. I’m going to make it again late, and probably give it 5 stars the second time around. Also, this is one of the few recipes I have found that doesn’t make WAY too much carrot cake. Most recipes I have found make enough to feed an army. Super good muffins and such a good both snack and as a breakfast meal! Easy and fun to make and delicious in mouth, 100% recommendation from me! I so want to make these…..like right now!!! They look so delicious! Just wondering if there is something that I could sub for oats [I am gluten and oat intolerant- yes even gf oats are a no go for me :( ]. Many thanks!! I think the pulp would work, yes. And I find the sugar necessary. But give it a try without! This is fabulous, really moist and yummy. I used almond butter instead of meal and it was great. I made these with 2 regular eggs instead of flax eggs, but followed the rest of the recipe ingredients perfectly. Then I made them into 36 mini muffins and baked them for 16 minutes at 375. They turned out great! Made these yesterday. Super tasty!!! I am not vegan so used 2 farm eggs. And used my own GF blend and added 1/2 tsp xanthan gum. They rose nicely! Topped with apple chunks and pecans. My 2 boys are loving them! Tried this recipe last night and absolutely loved it!! I think this is now my favorite GF muffin recipe. I substituted the oil with coconut oil and they still turned out good. The texture is perfect, not dense but light and fluffy. Thanks so much! I added 1/2 teaspoon of pumkin pie spice, 1 teaspoon vanilla extract, and substitued pumpkin puree for the applesauce for a little fall twist. It was so delicious. I highly recommend trying it. I made these. And we ate them. And now I’m very sad they’re gone. Why oh why can’t they magically appear again? These are amazing, delicious muffins. I made then with Bob’s Red Mill Whole Wheat Pastry Flour instead of GF stuff and it turned out perfectly. Yum!! I love this recipe so much! It is always a hit :) I have a couple questions, I am actually making it for my wedding reception as cupcakes and a cake. I normally make either the muffins or in a square cake pan, but this time I did two 6 inch pans. I was doing a practice round, and for some reason it wasn’t as light and fluffy. The two things I did differently were, I added a bit more baking soda and instead of hand grating the apple and carrot, used a food processor. Could either of these have caused it to be more dense? Also, I used the vegan cream cheese recipe. It turned out great, but after a few hours outside of the fridge, the icing sloughed off. Do you have any recommendations? Thanks so much. I’m GF and dairy free, your recipes are always my go to! Thanks for everything! Thank you so much for this recipe!!!! I have used it with whole wheat flour and unbleached all purpose flour as well and the results are always amazing. I even cut down on the sugar and it’s perfect!!! I love making then and it’s a healthy hit every time!!!! Thank you!!! Just made these. They are soooo good! And my kids loved, too! Will definitely be adding this to my repertoire. 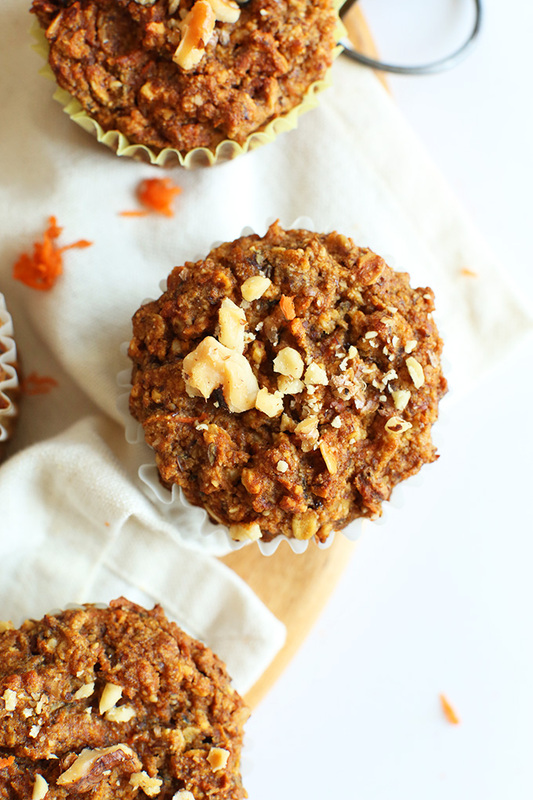 A healthier muffin that I don’t have to feel bad about giving my kids! I made these today, not knowing you were the author. My daughter is a big fan. Made a couple substitutions, and they were amazing. This will be my go-to recipe for all fruit muffins. Thank you. I’m not sure if maybe this has been answered, but what can I use to substitute the banana? I’m allergic and cannot eat that. Thank you! Hi Ronnie, I think leaving out the banana and replacing it with extra apple sauce or grated apple would work! We haven’t tried this recipe without the banana and can’t guarantee results but let us know how it turns out! This was my first time making something vegan gluten free and these turned out great!! I didn’t have any walnuts for topping but they were just as good without them. The recipe was easy to follow and they were pretty quick to make! I can’t stop eating them, they’re so good. Defiantly something to make again. I used potato starch and rice flour instead of GF flour blend and it was great! Only thing is, I’m not supposed to have cane sugar (I made an exception because this was the only recipe I could find that I had all the ingredients for and didn’t have eggs, dairy, gluten, all of which I cant eat). Any easy substitutions for brown sugar? Hi Caroline, glad those substitutes worked for the flour! Check our Recipe FAQ for ideas about brown sugar and cane sugar substitutions! My personal favorite is coconut sugar! Coconut sugar is my favorite brown sugar substitute. Usually, I replace half with coconut sugar, but have also completely eliminated sugar. I made this for my daughter for her afterschool snack and she can’t get enough of them. They are so packed with nutrition including fruits and vegetables that I feel it’s a good choice. In fact she loves them so much that she’s been eating them at lunchtime because she can’t resist! I tried doubling this recipe… I failed. I used two 9″ round pie tins, as I didn’t have muffin tins. I substituted the almond milk for coconut, and left out the almond meal (possible nut allergy). I also forget the salt. Needless to say, I’m not the most skilled baker. I baked it for over an hour and it still came out like a bread pudding consistency. Can someone explain why leaving these thing out did this? Or does this recipe just not double well? Any recommendations on how I could fix it up to serve anyway? It’s mush, but a very tasty mush. I’m so sorry to hear that Claire! I believe the almond meal would have helped with thickening up the batter so as to avoid a bread pudding consistency. Also, I know the salt may seem minimal but leaving it out could have also contributed to your results. Was there a reason you didn’t leave it in the oven longer to see if it would eventually firm up? If it was getting too dark on the outside, you could always cover it with a piece of aluminum foil while it continued to bake! Hope this helps! possible substitutes for almond milk? coconut milk? Check out our Recipe FAQ’s for information about substituting almond milk! I followed the recipe except for the banana and almond flour. I didn’t have bananas so I went ahead and added some apple butter in its place. Instead of almond flour, I put in a 1/2 cup of vegan protein powder. The muffins turned out delightful. Next time I will try adding a touch more Autumn spices to enhance the flavor further. Thank you! Can I sub coconut flour for the gf flour? Is there any reason coconut sugar wouldn’t work? I have a nut allergy, any suggestions for an Almond Meal substitute? I’m on the Fast Metabolism Diet and have been craving breads, sweets, or any baked goods. I found your recipe and substituted peaches for the banana, coconut flour for the GF flour, and couldn’t use any honey or agave so used some powered stevie to add additional sweetness. Well, it turned out really good! But like I suspected, it was a little crumbly. Thanks for the inspiration! I’m making this for a doggy birthday cake, and I’m wondering; if I completely leave out the brown sugar and agave, will the texture be compromised? It obviously won’t be as sweet, but since it’s for the pooch I figured that was best. Thanks for your beautiful blog! Hi Sonja! The newer recipes on the blog do have metrics! Sorry for the inconvenience! Thanks for all the great recipes!! My daughter is allergic to eggs and flax. Is there an appropriate substitute or can I omit the flax/egg? I think blended chia seeds with water also works as an egg replacement. They’re not unusual at all! Hahaha! All available at your local supermarket. ? Love these! :) Made them without sugar and added in 2.5 tablespoons of black strap molasses and they were perfect. Can you taste the black strap molasses in them? I’m not really a fan of its taste but would love to use it more since its so healthy! I’ve made these three times now and they are the most delicious muffins ever! All my kids, ages 10, 2 and 8 months old can barely wait until they cool down to eat them. Only change I make is using 2 eggs instead of the flax. Yuuuum. Thank u!! Thank you! I was wondering if I could sub eggs ? Any recommendations for a substitution for rolled oats – we have an allergy to oats. I have oat allergies as well. I use Quinoa flakes. So i blended some dates with water to make a syrup and processed more oats to replace the flour . .and it worked!! I made these using SPELT flour instead of GF and turned out great! I also added a handfull of organic died raisins and sliced almonds and then shredded coconut to remplace the almond flour. I liked them soo much that I made another batch just using fresh shredded pineapple instead of the Apple and shredded coconut instead of carrots. Again this Recipe is easy to adapt, thanks!! Wendy, did you use the same measurement for the Spelt flour? This was great! Thank you so much for the recipe! Some modifications I made: I substituted the gluten-free flour for half whey protein and half whole wheat flour (since I’m not a gluten-free-er). It turned out great, if just a tad bit on the moist side. I did use two eggs instead of the flax egg, so maybe next time I’ll try just using the white of one? I also added some raisins to the batter at the end since I’m going to take these climbing. I made mine in a cake pan, and they weren’t nearly as pretty as yours! I’m not much of a baker, but I enjoyed making these! Thank you! Hi, Just made these and are in the oven (lucky they made it as the mix was so yummy)… i am waiting impatiently for them to cook:-) Thank you…. Today was the second time I made these muffins. The first time I think I messed up with ingredients putting more of oatmeal than needed so they turned out dry. Today they came out nice and moist. I used buckwheat flour instead of gluten free flour mix, cause that’s what I already had in my pantry. I’m on dairy free and gluten free diet because I am breastfeeding and my baby is sensitive to all these. I was searching the internet for recipes to use the left over pulp from my juicer and so glad I found this one! I LOVE the idea of flax eggs (didn’t know about this before). These muffins were so moist and hearty. One muffin and a cup of coffee is enough for breakfast for me and is now my daily routine. Id love to try these but I have intolerance to bananas, do you have an alternate I could substitute.? Maybe mashed dates mixed with applesauce? Oh… I forgot to say that mine only took 20 minutes to bake. I used a 12 cup muffin pan and baked at 375 degrees as the directions say, but they were done in much less time. I made these this morning and they are really good, moist, and tender, but still hearty and healthy! I made my own flour blend, as you suggested, but substituted 1/2 cup of sorghum flour for the white rice flour and 1/4 cup of the brown rice flour. I find sorghum works well in recipes like this. I also omitted the apple (high FODMAP) and used grated zucchini instead , as well as a little extra mashed banana (1 med banana), and substituted ground pecans for the almond meal. Made these twice already and they are the best, my 1 & 4 year old love them too! I didn’t add any sugar but instead added chopped dates, sultanas & coconut flakes to add sweetness. I used 1 mashed banana, 1 grated apple, honey, full cream milk, wholemeal flour and also added a pinch of ginger and nutmeg. Baked for appr 27min on 175. Super healthy and delicious. Thank you. I used what I had on hand so subbed more applesauce instead of banana and used regular flour for the almond meal and gluten free mix. Bake less time when using all-purpose flour (mine took 25 minutes). So yummy!!! I’ve made these 5 times now. A definite favorite! My kids like them, the hubby, my coworkers…this recipe is a real winner! Nice and moist, delicious, and relatively healthy! I used honey and cut it I n half the last time I made them – still sweet enough! Did you have a non-GF version of this recipe posted previously? I thought it was on this site. I made it a year or so ago and I can’t find it anymore. It had apple, carrot, raisins, and an oat streusel. I used a real egg, all almond meal for the flour, and didn’t bother with the additional brown sugar. I was missing oats too, so I added some extra almond meal. They’re a little moist, but still plenty sweet without the added sugar! I only had the maple syrup. Thanks for the tasty recipe! Thanks for sharing, Callie! Glad you liked them. Great recipe and wonderful texture. I cheated by throwing a bunch of carrots, pecans, and an apple into my blender on the ‘chop’ setting (it was smaller than shredded). It worked great though. Thanks! Making these muffins was real fun! But at the end they didn’t bake through. I wonder why the outside was gummy like and the inside didn’t bake. The more I would keep them in the oven the harder they would get, but the inside still didn’t bake as it should be. I did everything by the recipe except for the favor mix, mine was 1/3 buckwheat 1/3 corn and 1/3 white rice… Please let me know cause I really loved this recipe! It’s definitely the GF blend. The one I suggest is best! Better luck next time. I want to try these next weekend to take on a surfing trip. Do xou think i can put some walnuts in the dough? Can i substitue the raisins with more dates or some cranberry´s? I would think so, but I haven’t tried it that way. Let me know if you give it a try! So excited about this recipe! I had some shredded carrots and beets, and some ginger left over (which I had chopped in food processor and squeezed out juice), and it worked perfectly in these muffins. I know muffins are quite forgiving when it comes to measurements, so I just kind of eye-balled most things. What a great way to get veggies for breakfast! The beets gave them a nice pink tinge. Thank you! Your cookbook is on my wish list! This recipe is not for busy moms like myself, who juggle going to school, raising a baby, and taking care of the house and three dogs, because between grating, measuring, and baking it took me over 2 hours to make these little morsels. So I am not sure what the author means by “15 min prep time”; my prep time was 1hr 30 min. However, what came out of the oven was totally worth the investment of time and effort. The muffins came out tender, fluffy, and delicious, not too sweet, not too bland. Just the way I wanted them. Given the fact that I did not follow all the proportions exactly by the recipe and I made some ingredient swaps, like subbing oats with raisins, quinoa flour for almond meal and gluten-free flour blend, and using two regular eggs (I am not vegan) instead of flax egg, the muffins still came out with a great texture and tasted amazing! Thank you so much for the recipe! I found my new favorite. I made these this morning, but instead of the milk, almond meal, flour, and oats, I used 1/2 cup arrowroot starch, 1 cup soaked whole buckwheat, and 1 cup soaked whole millet. They turned out amazing! I know these are a lot of changes, but really I just used whole grains instead of the flours. I processed the wet grains in food processor for a few minutes, then added all the other ingredients. Thank you for a good base to work with! These muffins are decadent! Such a great recipe! I did not have a banana so I used a grated apple in its place. I had cashew milk on hand so I used that instead of almond milk. These muffins are flavorful, moist, and you would never know they are gf or vegan! Fabulous recipe! I cannot wait to make them again and share them! These look delicious! I’d like to use pasture raised eggs, but how many? Baking up some of these right now! I’m new to gluten free arena so figured baking up a batch of these would be a nice start. House smells bomb already!!! I used coconut flour instead of the almond flour, grated an apple instead of the apple sauce, use chia egg mix instead of flax seeds and added some vanilla paste. I’m looking forward to the end result! The batter tasted good so I’m sure the end product will be great! I will keep you posted :) thanks for sharing!! Just to follow up; LOVE the muffins and my 12 year old son warmed one up and chowed down one for breakfast. Thanks for sharing this recipe. I look forward to trying more of your recipes as I transition into more gluten free/healthy food options for us. Hi Dana, Thanks much for a healthy muffin recipe. Been hunting for long. One quick question. Can i replace banana with anything else (don’t like ’em much, like at all) Or can i completely forgo without changing/adding anything else? I also used normal flour instead of gluten free flour and almond meal- which clearly didn’t make a difference. Love. Jordan, did you use the same measurement for the regular flour? I love so many of your recipes. I just made these muffins and they are so so good. Have you ver tried them with less sugar? If I did cut back on sugar which one should I cut or reduce? Thanks for sharing this recipe. I made a few adjustments and the muffins still came out delicious. I used 1 flax egg and 1 egg, and substituted coconut flour for the almond meal, since I didn’t have that. I also added cranraisins on top before baking. In the future, I will soak them first to soften them and mix them in. It’s a great recipe and very flexible. Mine took 43 minutes to bake and were still a little too moist in the center, but I didn’t want to burn them. Another time, I’ll bake them 45 minutes. I’m at 4500 feet, so that and the gluten free flours, and my unpredictable oven temperature may be the culprits for this. These are outstanding. I made one batch for a birthday party and had to instantly make another one because I ate too many. This never happened before with a vegan recipe. Highly recommended: Cut the brown sugar in half and drizzle with a cardamon vanilla icing (freshly ground cardamon, vanilla, icing sugar, some coconut oil, almond milk). Could you use dates instead of sugar? I made this in a loaf pan and it turned out SO GOOD, I halved the amount of brown sugar and maple syrup and it was just perfect. The walnuts were crisp and the texture was rich and moist :) I loooove your recipes! These are in my oven right now . The house smells amazing ! YOU DID IT! I have been trying carrot cakes recipes for a couple of months now, and this is THE BEST! The best is texture, in flavor, in consistency… I want to eat it every day! Thank you! These are awesome. I tweaked the recipe a bit so that I could use what I had on hand: I glutenized it by using all purpose flour in place of both gluten free flour and almond meal and subbed the banana for more apple. Turned out great! I actually did this. i used all purpose flour and it turned out great. I subbed both the gf flour and the almond meal. Have you ever tried making these with like oat flour or almond meal instead of the gluten free flour mix? If not, do you have any recommendations on how to do so? I need some help….how would I sub date paste in this recipe or any of your recipes that call for sugar? Also….can I sub coconut flour for the almond flour? I used 6 whole pitted Medjool dates instead of brown sugar (you could also use 1/2 cup date paste). Just put the dates (or date paste) in the blender with the olive oil, apple sauce, mashed banana, almond milk, and maple syrup and purée it until it is smooth so the dates/paste get fully incorporated. Then pour the purée into the bowl with the rest of the ingredients. They turned out perfectly sweet and there was no overpowering date taste whatsoever. Absolutely delicious! Thank you! I will give that a try on Sunday! I love love LOVE your website!! My family is not vegan, but your recipes are so delicious, no one seems to miss the meat/dairy/etc. I made this recipe to appeal to my picky toddler and she is gobbling one up as I type this. I made some substitutions because of what I had on hand (namely pineapple instead of apple and dates instead of brown sugar), and they are still glorious. Thanks for being a big part of our family’s meal time! These are the best muffins. Moist, delicious, crave worthy. I add the nuts to the mix and add extra. My children ask for these every week. Perfect breakfast or snack. I’ve used different types of flour if I don’t have what the recipe calls for and always turns out GREAT! Mmm! I am eagerly anticipating the carrot loaf in the oven. This recipe, and so many more on your web site are lovely. And the beautiful photographs! Very inspiring. One request I have, though, is for a second “printer-friendly version” button closer to the top of the page, maybe below the title. I appreciate all your wonderful photographs but sometimes my Internet connection is very slow! (i’m sure others find themselves in a similar dilemma). Thanks once again! but I was just wondering, can I substitue the rolled oats by something else and the almond meal? I live in belgium and I’m not sure I can find these 2 ingredients. Wonderful recipe!!! So good it’s our new favorite muffin! I subbed 2 eggs for the flax eggs; ground oats for the almond meal; used real milk; doubled the cinnamon and added ground cloves, allspice, & ginger. (I’m not vegan obviously.) It made 23 muffins (oiled the tins/no papers) and I baked them a total of 25 minutes. There were only a few left an hour after baking them–my boys LOVED them with vegetable soup tonight! Gorgeous color and a real treat with walnuts pressed into them. Just great!!! I may lightly frost the remainders with cream cheese frosting tomorrow for a dessert. I’ve made this recipe several times, first as a loaf, then as muffins. I have to say it is without a doubt my favorite quick-bread/muffin type recipe! The loaf was good, but the muffins hands down have the best texture of any gf baked good I’ve made. I love how they’re not too sweet, just enough to satisfy a sweet tooth craving without guilt. Basically I’m in love. I wanted to make this for a long time, and today I finally had the time to bake. This was very easy to put together; the directions are simple to follow and everything goes in the same bowl. I decided to bake this in an 8×8 pan instead of making muffins. They came out so delicious, and fluffy, and moist. I also made several substitutions. I am not vegan or GF, so I used two large eggs, regular milk, non-GF rolled oats, and non-GF flour. I also omitted the almond the almond meal and subbed the same amount of flour. My last substitution was using pecans on the top instead of walnuts. This took 1 hour to bake. I started with 45 minutes and then did 5-minute increments after. I really like that this recipe is so easily adaptable to diets that are not GF or vegan. I will definitely make these again. Hello there! My friend and I aren’t vegan but we absolutely loved making these Majestic Muffins! Just wanted to say that these are the healthiest and tastiest muffins we have ever set eyes upon! In fact, these have become the only muffins we eat, and even our vegan friend is obsessed with these! When not giving these to my vegan friend, however, we must admit we like to add an egg as it really strengthens the mixture. Cheers to a fantastic recipe! Carry on your good work for the new year!! Dana, your recipes are amazing! These are brilliant… So delicious and nutritious too. Have been a big hit in our household!! Now am planning on doing the zucchini cake muffin style. Thank you for sharing so many amazing ideas and recipes and inspiring my cooking each day! All in all I’m quite happy with the resulting muffins :) Will make again! I’ve made these twice now and have gotten huge “yum”s and “thank-you”‘s from my kids. These muffins are delicious and will be prepared frequently in our house now! Thank you for sharing! So glad I found you. I love all your recipes. You are my go-to recipe site! Thanks so much! I made these muffins tonight and they were hands down the best gluten free muffins I’ve ever had, and not too sweet. The consistency was a slightly crisp outer shell with a soft and crumbly (in a good way) middle. I added cranberries, and they were a nice addition. I’ve been gluten free for a while and one of my big cravings has been for my homemade muffins I used to make my kids for breakfast, and these muffins were perfectly satisfying! As a bonus, my kids ate them with rave reviews. Love it, i didnt bake much since I become gluten free (3 years) . This is absolutely wonderful recipe and loved how much soft and spongy texture it had, I will def try other recipes from your site. . I didn’t have almond milk so I substituted it with 1% regular milk. No other substitutes. I only baked for 25 minutes , could have used 2-3 minutes less too. My 11 year old loved it but recommended adding some chocolate chips next time -lol. I still make these without the olive oil? Thank you. It will negatively affect the texture. I’d sub more almond meal and gluten free flour! I was pleasantly surprised with the outcome! I only eat natural sugars. Can I exclude the brown sugar or replace it with an unrefined alternative? I would love to make these! Hi! I love your website and all your recipes. I want to try this gluten free muffin recipe for daughters birthday as she is gluten sensitive, but she is also allergic to flax. Can I sub real eggs, how many will I need? and how long should I bake – I don’t want to overcook eggs (don’t like the eggy smell).. Thank you so much! Hi! My daughter can’t eat nuts- what can I substitute for the almond meal? Regular flour? I would sub a mix of oat flour and regular flour! I am making this in mini cupcake versions for my Sons school Winter potluck. Is there a way I can decorate the cupcakes. I thought of cream cheese. But is there any other healthy nut-free way I can decorate it. Hi, I tried the recipe with normal all purpose flour. All other things were the same as given in the recipe. I got 12 regular sized muffins and 2 mini cupcakes. The day I baked the muffins, I felt they were bland and needed some more flavor. But the next day, they tasted awesome. Will be making these for sure! Has anyone made these into mini muffins?? Planning to make some for my one year old for easy on the go snacks. Just wondering what the baking time would be….thanks! These are great! i even substituted quinoa for the oats (since i didn’t have any) and it worked fantastic! love these they taste so wonderful and made me feel good about eating something healthy! I had so many carrots lying around I had to find a vegan muffin recipe and these were perfect even with the addition of pumpkin. I also drizzled some date butter on them for some extra sweetness. Hi, can I do it in a pan 9×5 ?? I always subset coconut oil for olive or vegetable oil in my baking and it always turns out great. I haven’t tried this recipe yet, but will soon. Just put these in the oven. I used a large egg and omitted the brown sugar because I wasn’t looking for super sweet. Then I put some on to with the walnuts. Can’t wait to eat one but the waiting time is almost as long as the baking time! ? This recipe was great! We used rice milk and it turned out fabulous!! My daughter is allergic to both banana and nuts do you have another way to make this recipe? Well, sometimes bananas can be replaced by applesauce in recipes. And you could try using seeds instead of nuts? I did not have a banana so I just used two grated apples instead and they turned out fabulous!!! These are lovely! :) Dana, could you tell me the dimensions or your muffin tin / tray? I need to buy one of those, but the sizes are so different. Thank you! Hmm, mine is very standard with 12 tins. Sorry I couldn’t be of more help! Oh, so good. I’m learning you like your muffins sweeter than I do, so I used only 1/4 cup of coconut palm sugar instead of the 1/2 cup of brown. Another stellar recipe, and I appreciate that your posts are always loaded with tips and versatility. I am new to gluten free baking but I made these last night. I used 1 large egg, maple syrup and added some red mill shredded coconut moisten with a little water. They are delicious! Next time I make them, I will double the walnuts on top! I took a picture of them but don’t see a way to upload it. I cooked them in a convection oven which converted the temp and time for me. I took the muffin tin out after cooking and left it overnight. I’ll be making these again!!! My husband liked them too. So kind! thanks for sharing, Janelle! Thanks for this great recipe! I made these with oat flour and white whole wheat flour instead of the meal and gf flour. I also added a little ginger and nutmeg. Very moist and delicious! I don’t have all the gluten free flour ingredients, can you sub regular flour or another gluten free flour? I have almond and garbanzo bean flours as well as regular all purpose flour. I looked at the other comments and got my answer! Thanks! Can’t wait to make these! what could I use in this recipe instead of almond meal and almond milk to make it nut free? Sooooo yummy! I had to use coconut flour I also upped amounts of flours as no GF oats, they are crazy expensive in Singapore and I will be making them again! Thank you!! I have tried this recipe twice so far (and also shared with my co-workers). Every time they come out fantastic! 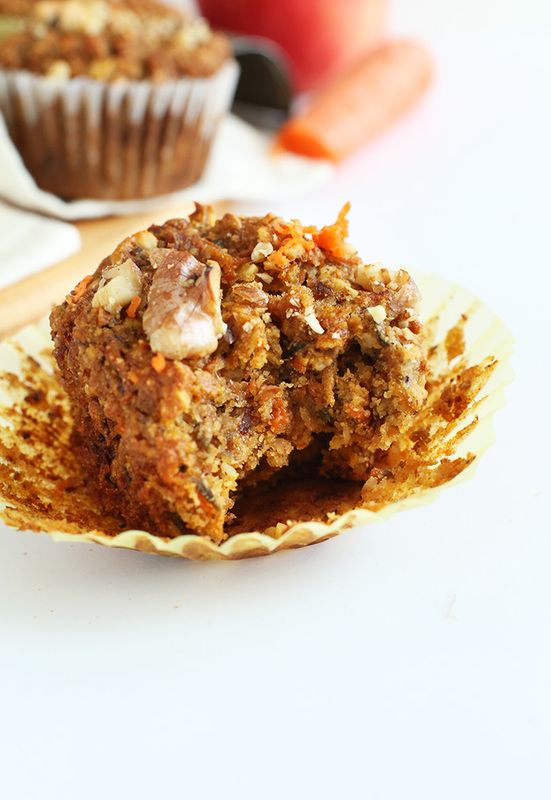 It’s like a banana carrot cake muffin and has just the right amount of sweet. Thanks for posting this! I am adding it to my favorites to put into rotation! If you are going to any kind of brunch or potluck this is such a perfect thing to bring. It’s healthy and delicious and no one will believe it’s gluten free! That’s wonderful! thanks for saying hi, Mary! We aren’t vegan or GF, but this recipe sounded so yummy I wanted to try it. I used 2 eggs, 1 banana, maple syrup, unsweetened applesauce, brown sugar, grated baby carrots (WOW that took a long time but it was all I had! ), old fashioned oats and just 1.5 cups unbleached flour. Cooked them for 37 minutes. They turned out great!! Oops, and I used 1/2 cup 2% milk. Great! Thanks for sharing your swaps, KJ! Hi Elizabeth, wondering what your baking time was, is it less because of the eggs? thanks! what can i use as a substitute for the almond milk? rice milk, hemp milk, or water! I just made these, followed the recipe exactly, and they turned out fantastic! They are just a tad sticky on the bottom but it’s dry out here in the desert so they may get dryer by the end of the day. Fantastic recipe. I used whole meal and it came out super delicious. New to GF recipes… My wife is also allergic to oats, what would work in place of those? You can try and sub more almond meal, quinoa flour, or more GF Flour blend! Thanks Dana! I suspect that the oats are providing some body that flour just won’t. I’ll give it a try without – maybe adding some sliced almonds for bulk and body. Thank you! I was going to ask the same question about how to replace the oats. I wonder if rice bran would also work? I love your recipes! Thank you for sharing them with us. My two kiddos (5 and 3) and I made these this morning in texas sized muffin pans and they were SO good! Seriously, so good. I think we will be making these on a reg basis for sure :) Thank you so much for this wonderful and delicious recipe.